Cyndi Lauper’s She’s So Unusual was one of 1983’s biggest albums. It spawned hits like Girls Just Wanna Have Fun, Time After Time, and All Through The Night. Not to mention catapulting Cyndi into the stratosphere as one of the most successful artists of the decade. This multi platinum album was one of those totemic 80’s LP’s that kept spinning out hits like an arcade game. It just didn’t quit. 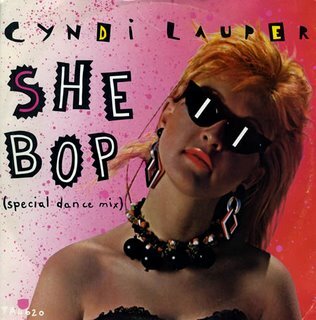 She Bop was a Top Ten hit from She’s So Unusual that was a statement in its own right. I mean…come on! Was there anybody who didn’t know what this song was about? I remember walking around in high school grinning with everybody else about how big this song was on the radio and how its video was all over MTV, and nobody seemed to notice what it meant but us kids. It was hysterical! And it still is. She Bop is a don’t stop number that goes round and round in the head like a mad top. You can’t get this one out of your mind and you find yourself singing along with it even when you know you probably shouldn’t. At least not in public. But Cyndi Lauper had great fun with it…and so did we. Even if we still grin whenever it plays on the radio.